In the summer of 2019, I will be an intern at FAIR working with Manolis Savva and continuing my on-going collaboration with FRL. In the summer of 2018, I was a research intern at Facebook Reality Labs (FRL) and Facebook AI Research (FAIR) working with Julian Straub and Dhruv Batra. As an undergraduate, I participated in a 3-2 engineering program with Juniata College and Washington University in St. Louis (WUSTL). While I was at WUSTL, I worked with Yasu Furukawa (now at SFU). I spent a summer at Lehigh University and worked with Yinzhi Cao. To help bridge the gap between internet vision-style problems and the goal of vision for embodied perception we instantiate a large-scale navigation task – Embodied Question Answering  in photo-realistic environments (Matterport 3D). We thoroughly study navigation policies that utilize 3D point clouds, RGB images, or their combination. Our analysis of these models reveals several key findings. We find that two seemingly naive navigation baselines, forward-only and random, are strong navigators and challenging to outperform, due to the specific choice of the evaluation setting presented by . We find a novel loss-weighting scheme we call Inflection Weighting to be important when training recurrent models for navigation with behavior cloning and are able to out perform the baselines with this technique. We find that point clouds provide a richer signal than RGB images for learning obstacle avoidance, motivating the use (and continued study) of 3D deep learning models for embodied navigation. We present Habitat, a new platform for the development of embodied artificial intelligence (AI). Training robots in the real world is slow, dangerous, expensive, and not easily reproducible. We aim to support a complementary approach – training embodied AI agents (virtual robots) in photorealistic 3D simulation and transferring the learned skills to reality. We also describe the Habitat Challenge, an autonomous navigation challenge that aims to benchmark and accelerate progress in embodied AI. Erik Wijmans^, Samyak Datta^, Oleksandr Maksymets^, Abhishek Das, Georgia Gkioxari, Stefan Lee, Irfan Essa, Devi Parikh, Dhruv Batra. 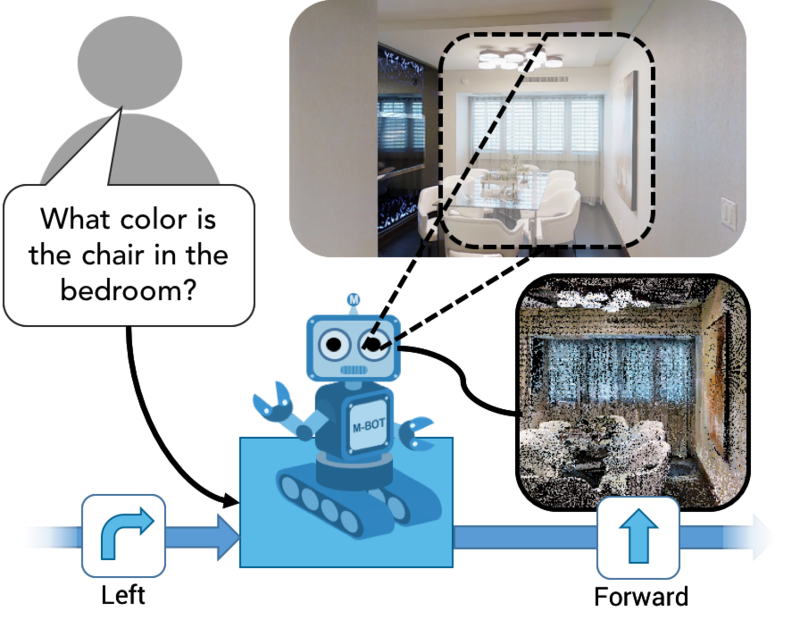 Embodied Question Answering in Photorealistic Environments with Point Cloud Perception. CVPR, Oral, 2019. Manolis Savva^, Abhishek Kadian^, Oleksandr Maksymets^, Yili Zhao, Erik Wijmans, Bhavana Jain, Julian Straub, Jia Liu, Vladlen Koltun, Jitendra Malik, Devi Parikh, Dhruv Batra. Habitat: A Platform for Embodied AI Research. arXiv, 2019. Erik Wijmans, Yasutaka Furukawa. Building Scale RGBD Alignment. CVPR, 2017. Yinzhi Cao, Song Li, Erik Wijmans. (Cross-)Browser Machine Fingerprinting. NDSS, 2017.